Couldn’t really come up with any music that inspires me this weekend. But this picture, which came in an email from Auntie, did have that effect. It reminded me of a ghost story that comes from the early history of Cades Cove, my favorite place on earth, the place I hope heaven looks like. The story is told by Randy Russell and Janet Barnett in their 1999 book THE GRANNY CURSE AND OTHER GHOSTS AND LEGENDS FROM EAST TENNESSEE. Cades Cove is now contained within the Great Smoky Mountains National Park, but for most of the nineteenth and early part of the twentieth centuries it was home to a thriving mountain community. Two members of that community were Basil and Mavis Estep (a common name in the Cove’s graveyards), a man and wife who married young, raised a family, and died in the cabin they’d lived in their whole married life. Mavis Estep was a bit strange. She was deathly afraid of being struck by lightning, say Russell and Barnett, because she had been born in the midst of a raging thunderstorm, and as mountain lore had it was bound, therefore, to be killed by a lightning strike. She would not handle anything metal during a thunderstorm, not even her beloved quilting needle. She was an amazingly talented quilter among quilters. Her favorite of the ones she made had pieces from the shirt Basil was wearing during the first quarrel they ever had as man and wife, pieces of red flannel sewn in among the rest of the pattern. She called that one the Cussin’ Cover, because Basil had used such shocking language during that quarrel. They only used it on the very coldest nights–on the marital bed, which was of solid wood with no metal springs, no metal in the frame, not even metal screws to hold it together. Now Mavis, as it happened, did not die of a lightning strike. Her last illness seems to have been a lingering one. On her deathbed, she made Basil promise two things: that her quilts would be kept in the family, not sold to the collectors who were, by then, buying up mountain products, and–the most important one–none of them would EVER be put on a metal bed. Basil promised, and, seemingly content, Mavis breathed her last. Basil hated being a widower. Within a year he married again, a girl young enough to be his granddaughter, a member of another Cove clan named Lawson. She was an alarmingly large girl, far bigger in height and weight than her scrawny old husband, and Mavis’s old wooden bed did not suit her at all. She talked Basil into buying a bed with a metal frame and metal springs. Still, all might have been well had Basil not given in to her demands for heavy covers on the cold winter nights, and placed Mavis’s quilts on that metal-framed, metal-springed bed. His young wife–her name was Trulie Jane–especially loved the one Mavis had called the Cussin’ Cover. But the first night Basil placed it on the bed, Trulie Jane was awakened in the wee hours by the apparition of Mavis Estep, standing at the foot of the bed, swearing a blue streak. Trulie, scared witless (although, truth to tell, she was not the brightest to begin with) woke Basil up, but he couldn’t see or hear a thing. But then, he didn’t have much longer to live, you see. Trulie had gone back to sleep, and Basil was nearly so, when there was a great popping noise accompanied by a blinding flash of light and the smell of burning. Whatever it was, it knocked Trulie Jane out in the middle of the floor. She got up and ran for help. When her father and brothers got there they found the cabin still standing, but Basil had been burnt to a crisp by a fire that was confined to where the metal-framed, metal-springed bed had stood. The metal parts of the bed had melted, leaving a bed-shaped burn on the floor. The strange thing was, there was no lightning or even a threat of a storm reported anywhere in the Cove that night–only the single lethal strike that killed Basil Estep in his young wife’s metal-framed bed–the type of bed Mavis had warned him never to place her quilts on. 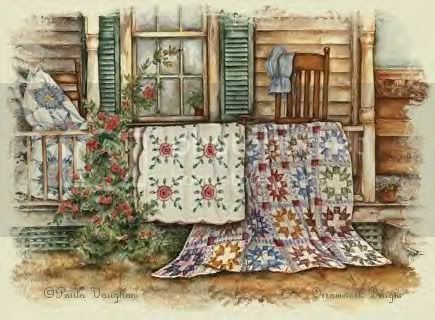 Trulie Jane never used any of those quilts made by her late husband’s first wife again; she gave them to Mavis’s daughters. The one who got the Cussin’ Cover sold it to a collector despite her mother’s deathbed wish. The daughter said she needed the money. Most likely she didn’t want to risk the fate that befell her father, who gave in to a young wife’s whim for a metal-framed bed, put Mavis’s quilts on it, and died for it. Rumor has it that quilt’s still out there somewhere, perhaps for sale in a Gatlinburg or Pigeon Forge collectibles shop. If there’s one there with little pieces of red flannel in among bigger pieces of the pattern, DON’T BUY IT. Or if you do, don’t ever put it on a bed with any metal parts. After all, look what happened to Basil. You don’t break a deathbed promise to a mountain woman. No sirree bob, you don’t. Oh, yes … I remember this, but had apparently forgotten the Cades Cove connection. I remember in particular because right now I have a metal bed, for the first time in my life, and when you told this on the Stream, it gave me the heebie-jeebies because the bed is pretty much flanked by windows on two sides. But I have another bed in storage, and reading this again may just prompt me to get that bed out again. Wouldn’t want to be burnt to a crisp some stormy night. On the other hand — LoL — the whole thing does beg the question of whether memory foam mattresses would ground lightning. LOL–I don’t know about the memory foam mattresses and grounding. I have a wooden bed myself–but it has box springs (presumably metal) and is held together with metal joints and screws–and is flanked to my left and right (that last over my shoulder) by windows. Fortunately, perhaps, I was born on a rainy morning, but there was no lightning. God willing, a lightning strike ain’t the way I’m fated to go. You just had to go and remind me of this story after me buying an iron bed this past Christmas. Oh well, I’ll just have to take my chances. Love the story.